Having grown up in Jackson, one of my most vivid childhood memories is of walking with my two older brothers down a darkened hallway on the third floor of the Old Capitol Museum in downtown Jackson, moving slowly over the creaking floor boards, trying so hard to avoid the noisier ones. The goal of this journey was to catch a glimpse of the museum’s Egyptian mummy, a small shrunken figure that was kept in a case at the head of the stairs next to the rotunda wall. We would nervously approach this case, our wide eyes fixed on the dark shape within. And when the brown features of the mummy’s face would suddenly become visible in the shadows behind the glass, our adventure would climax in a wild giggling, heart-thumping dash down the stairs, into the light, and away from the small horror, wrapped and still, in its secret world. Over the years, I would ponder this strange little figure and wonder. Had it been the child of a commoner or that of a pharaoh? How had it come to Jackson of all places? I had never bothered to ask anyone and my brothers’ only interest in it had been its fright factor, so I remained ignorant of its origin. Imagine my disappointment then when I learned that our fearsome mummy, this dark specter from our past, was nothing more than a clever construction of boards, burlap, newspapers, papier-mâché, and animal bones. No royal history, no mysterious life by the Nile, only this dark display case at the head of the stairs. At some point, the mummy disappeared from the museum, becoming a dim shadow as I grew older. When the opportunity came along to write this column for The New Southern View, I immediately thought of our little friend from the past and contacted Michael Wright, the museum’s curator of collections, who told me that the mummy was still listed among the possessions of the museum, but now in storage. Acquired by the museum (left) along with an assortment of Indian artifacts from a Yazoo planter in the late 1920s, the mummy was thought by all to have been a young female Egyptian. But an x-ray examination in 1969 by Gentry Yeatman, then a student at The University of Mississippi Medical Center and a member of the Mississippi Archeological Society, disclosed that what everyone once thought was an authentic mummy was anything but. Closer examination revealed that the mummy contained, among other things, fragments of two newspapers—one was a German language newspaper, and the other, the Milwaukee Daily Journal from 1898. It is easy to see how this could have happened. Even though it was proved a fake more than 30 years ago after fooling the public for half a century, I still experienced a thrill upon seeing it once more. 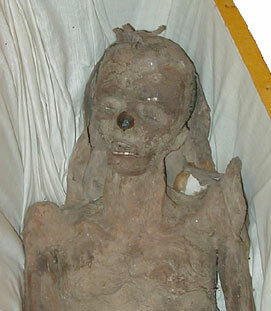 I hope that Mississippi's Dummy Mummy may one day get another chance to test our gullibility. 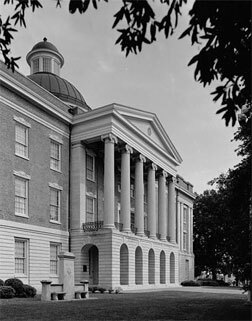 Click here to link to the Old Capitol Musem's website. This link will open a new page.